Listed below are some of the events that took place during Expo 86 special tribute to air travel. DC-3 Airmada and Rally: June 5 - 7. In celebration of 50 years of commercial service and in recognition of the great contribution of the DC-3 to the expansion of air transportation throughout the world, DC-3 aircraft joined in an exhibition at the Abbotsford Air Show and flypast over the skys of Expo 86. Flight Into History: August 4, 7. 40 aircraft from prop planes to jets participated in an historic flypast over the Expo site. A descriptive commentary of the planes was broadcast on the Expo PA system. Air Fair 86: August 4 - 10. 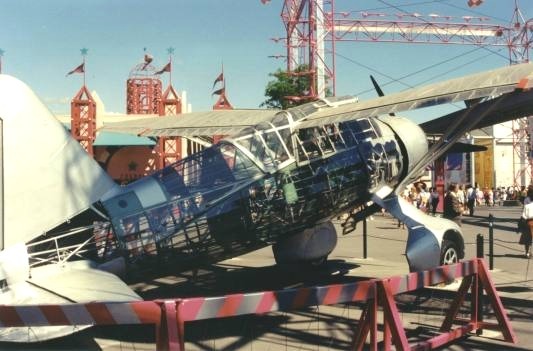 This international aviation exhibition featured the North American debut of three Soviet aircraft and a variety of technological innovations for the aviation industry. Abbotsford International Airshow: August 8 - 10. Held every year at the Abbotsford Airport, this show has earned an international reputation for being one of the best. This Airshow worked in conjunction with Expo 86 to bring some of the most notable planes to Vancouver including the Concorde. Aircraft Construction and Restoration. In the Air Plaza, several home-made planes were being erected beside several antique planes in the process of being restored.